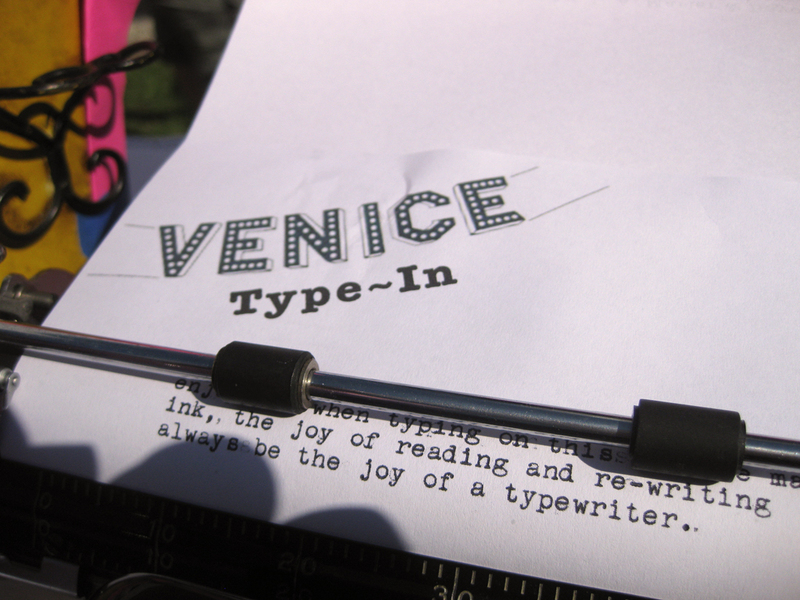 This entry was posted in Typewriters and tagged typecast, typewriter, typosphere, Venice type-in by BusterBullet. Bookmark the permalink. I had a quick look at this post yesterday, Buster, but came back now to read it through to the end. Sounds like you had a great time. Man, I wish we’d have one of these get-togethers in my burg. One day, maybe. That Orson Welles Royal is too damn cool. “We are all, every one of us, doomed to play the hero in our own life story.” Welles said that at the Oscars a few years before he died, and that’s what I would have typed on that machine…er, assuming I’d have been allowed to. Thanks for the wrote-up, and I can see how you would have been absolutely beat by the end of the day. Yeah, it was all pretty cool. Incidentally, your blog page briefly appears in the film. Did you know that? Nope, I had no idea. So that’s my fifteen minutes of fame, huh? Darn. Oh well, maybe the film will win the “Best Documentary Feature” Oscar next March. Thanks for the tip-off, BB. I’ll have to keep my eyes open for it.